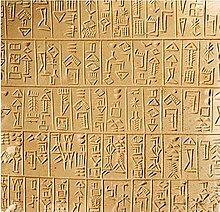 Jean-Jacques Glassner, The Invention of Cuneiform, English translation, Johns Hopkins University Press (2003), আইএসবিএন ০-৮০১৮-৭৩৮৯-৪. René Labat, Manuel d'epigraphie Akkadienne, Geuthner, Paris (1959); 6th ed., extended by Florence Malbran-Labat (1999), আইএসবিএন ২-৭০৫৩-৩৫৮৩-৮. Wolfgang Schramm, Akkadische Logogramme, Goettinger Arbeitshefte zur Altorientalischen Literatur (GAAL) Heft 4, Goettingen (2003), আইএসবিএন ৩-৯৩৬২৯৭-০১-০.